The participating systems will be asked to generate new translations automatically among three languages, English, French, Portuguese, based on known translations contained in the Apertium RDF graph. 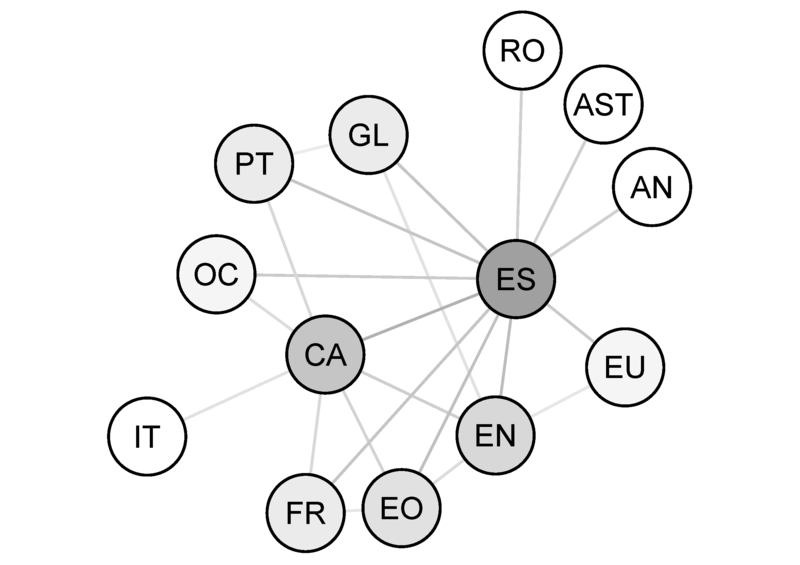 As these languages (EN, FR, PT) are not directly connected in the graph, no translations can be obtained directly among them there. Based on the available RDF data, the participants will apply their methodologies to derive translations, mediated by any other language in the graph, between the pairs EN/FR, FR/PT and PT/EN. Participants may also make use of other freely available sources of background knowledge (e.g. lexical linked open data and parallel corpora) to improve performance, as long as no direct translation among the target language pairs is applied. Apertium is a free open-source machine translation platform. The system was initially created by the Universitat d’Alacant and it is released under the terms of the GNU General Public License. In its core, Apertium relies on a set of bilingual dictionaries, developed by a community of contributors, which covers more than 40 languages pairs. Apertium RDF is the result of publishing 22 Apertium bilingual dictionaries as linked data on the Web. The result groups the data of the (originally disparate) Apertium bilingual dictionaries in the same graph, interconnected through the common lexical entries of the monolingual lexicons that they share. The picture above illustrates such unified graph. The nodes in the figure are the languages and the edges are the translation sets between them. The darker the colour, the more connections a node has. All the generated information is accessible on the Web both for humans (via a Web interface) and software agents (with SPARQL). All the datasets are documented in Datahub. A simple, multilingual Search Interface is also available. As a result, two independent monolingual lexicons were published on the Web of Data per dictionary, along with a set of translations that connects them. Notice that the naming rule used to build the identifiers (URIs) of the lexical entries allows to reuse the same URI per lexical entry across all the dictionaries, thus explicitly connecting them. For instance the same URI is used for the English word “bench” as a noun: http://linguistic.linkeddata.es/id/apertium/lexiconEN/bench-n-en along the whole Apertium RDF graph, no matter if it comes from, e.g., the EN-ES dictionary or the CA-EN. 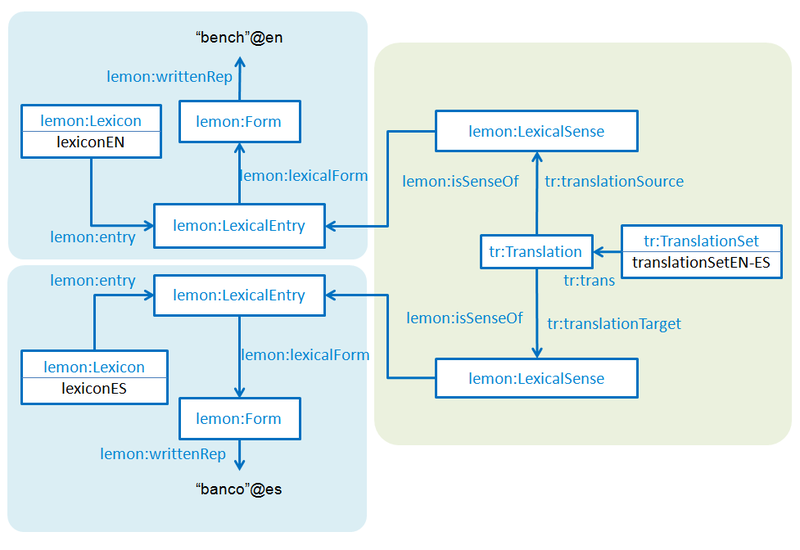 As can be seen in the picture, lemon:LexicalEntry and their associated properties are used to account for the lexical information, while the tr:Translation class puts them in connection through lemon:LexicalSense. Such lexical a information is basically the part of speech (lexinfo:partofSpeech), the form (lemon:Form) and its associated written representation (lemon:writtenRep). Querying the data online through the SPARQL endpoint. An example of a query to get direct translations from a single term can be found here. An example of a query to get the whole list of translations from the EN-ES translation set can be found here. Downloading the data dumps available in Datahub.To that end, follow the link here to obtain the list of the 22 bilingual dictionaries. You can visit those of your interest and download the data by clicking on "Zipped RDF Data Dump". Once you have stored the RDF data locally, you can process and query it by means of RDF frameworks like Apache Jena or Apache Fuseki, for instance. Possibly, not every participating system will need all the above information, but we keep it for completeness. The confidence score takes float values between 0 and 1 and is a measure of the confidence that the translation holds between the source and target written representations. If a system does not compute confidence scores, this value has to be put to 1. Once you have sent the output data (inferred translations), the evaluation of the results will be carried out by the organisers against manually compiled pairs of K Dictionaries and other resources. The performance will be measured in terms of precision, estimated recall, coverage, ... and the results published in this website.